In collaboration with the UI Council on the Status of Women, IWA will welcom Susan Birrell for a talk and Janet Schlapkohl for a dramatic reading on Thursday, March 28 starting at 4pm in the Iowa Women’s Archives (3rd floor south of the Main Library). University of Iowa is a recognized leader in women in sport and physical education. Four years ago, the University of Iowa Libraries celebrated that legacy by digitizing a collection of the UI Department of Physical Education for Women. Below is more information about this remarkable digital collection. Almost 1000 historic photographs of University women’s physical education classes – from archery and synchronized swimming to basketball and dance – are now publicly available online. In celebration of Women’s History Month, the University of Iowa Libraries has released the UI Department of Physical Education for Women digital collection: http://digital.lib.uiowa.edu/wpe . The photographs, spanning almost 100 years (1906-2004), are part of a larger manuscript collection that documents the rise of women’s athletics at Iowa from the one-member Department of Physical Culture and Athletics to the dawn of women’s intercollegiate sports. The Department of Physical Education for Women at the University of Iowa was a pioneer in the development of graduate study and professional training as well as athletic opportunities for women. Intercollegiate athletics for women at The University of Iowa originated in the Department of Physical Education for Women in the late 1960s and early 1970s and maintained that association until 2000. This relationship stemmed from the philosophy of the women physical educators and the value they placed on education and women-centered and -controlled sport. This historic image collection is the latest edition to the Iowa Digital Library — http://digital.lib.uiowa.edu — which contains more than 225,000 digital objects, including photographs, maps, sound recordings and documents from libraries and archives at the UI and their partnering institutions as well as faculty research collections. To explore the vast digital holdings from the Iowa Women’s Archives, a portal that allows users to browse by subject, time period or artifact type is available online at http://digital.lib.uiowa.edu/iwa . It will be continually updated with new items drawn from the IWA’s 1100 manuscript collections, which have provided valuable primary source materials for books, articles, theses and class projects on women’s history. For more information about the collection, contact Kären Mason, Curator of the Iowa Women’s Archives, at 335-5068. 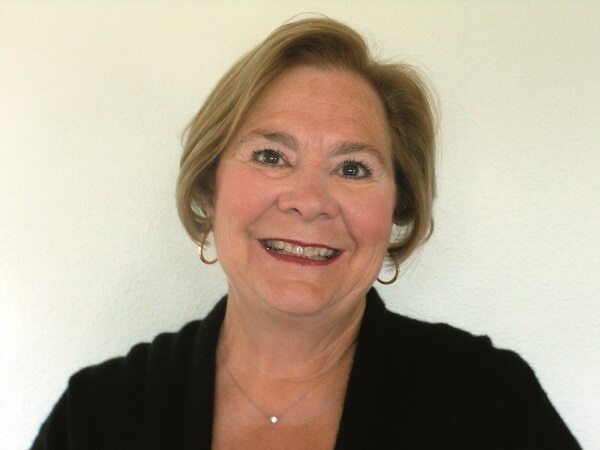 As part of the celebration of the 20th anniversary of the Iowa Women’s Archives, Suzanne O’Dea will read from her new biography of Archives co-founder Mary Louise Smith and take questions about her research for the book. Join us for coffee and pastries at 10:30 a.m. on Saturday, November 10th, in the North Exhibition Hall of the University of Iowa Main Library. 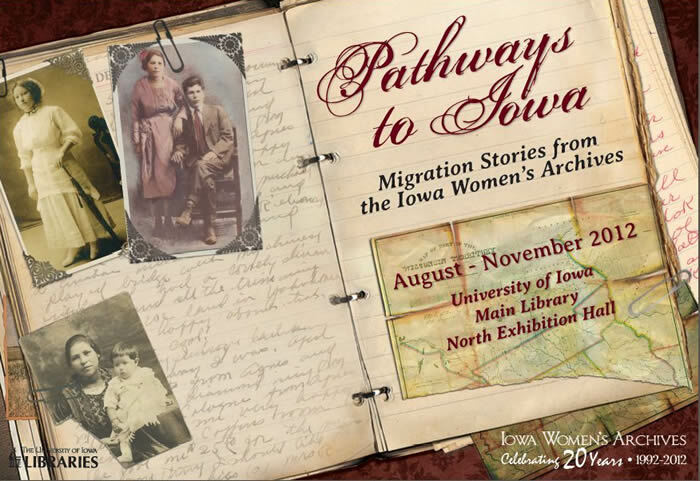 After the program, enjoy the exhibition Pathways to Iowa: Migration Stories from the Iowa Women’s Archives, or join Curator Karen Mason for a tour of the Iowa Women’s Archives. Parking is available in the cashiered lot west of the library. The library opens at 10:00 a.m. on Saturdays. 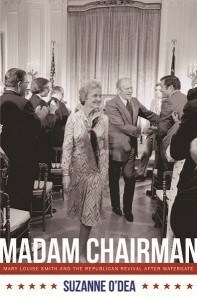 Madam Chairman: Mary Louise Smith and Revival of the Republican Party After Watergate, published in October by the University of Missouri Press, is based on extensive interviews O’Dea recorded with Smith and her staff at the Republican National Committee in the early 1990s, and on archival research in the Mary Louise Smith Papers at the Iowa Women’s Archives and the Gerald Ford Papers at the Ford Presidential Library in Ann Arbor, Michigan. Madam Chairman explores the career of Mary Louise Smith, a woman in a world of politics run by men, to recount Smith’s and the GOP’s changing fortunes but also the challenges Republican women faced as they worked to gain a larger party presence. Like many women, Smith started out making coffee, stuffing envelopes, and knocking on doors at the precinct level, and honed her political skills in Republican women’s organizations at the state and national level before being elected Republican National Commiteewoman from Iowa in 1964. 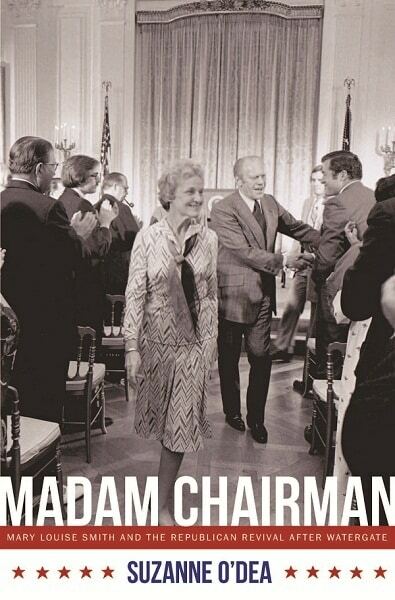 Smith became the first woman to serve as chairman of the Republican National Committee when President Ford appointed her to the position in 1974. During her twenty-eight months as chairman, Smith worked to rebuild the party following the devastation of Watergate, developing innovative fundraising strategies still used today. A supporter of the Equal Rights Amendment, reproductive rights, and gay rights, Smith grew increasingly alienated from the Republican Party as its leadership shifted from the moderate views espoused by Ford to the more conservative leadership still seen today, yet she remained loyal to the party. Suzanne O’Dea is the author of three books, including Legislators and Politicians: Iowa’s Women Lawmakers. She lives in McKinleyville, California. Join Iowa Women’s Archives Curator Kären Mason, Assistant Curator Janet Weaver, and faculty members Omar Valerio-Jiménez and Claire Fox for a brown-bag discussion of Latina history in Iowa at the opening of the newest exhibit at the UI Main Library. Wednesday, September 12, 2012, 12:00- 1:00 p.m. PLEASE NOTE: The South entrance to the UI Main Library is closed; you will need to use the North entrance.